Age-related macular degeneration (AMD) is a progressive, blinding eye disease affecting individuals over age 50. Over fifteen million people in the U.S. have been diagnosed with macular degeneration, and approximately two million new cases are diagnosed each year. 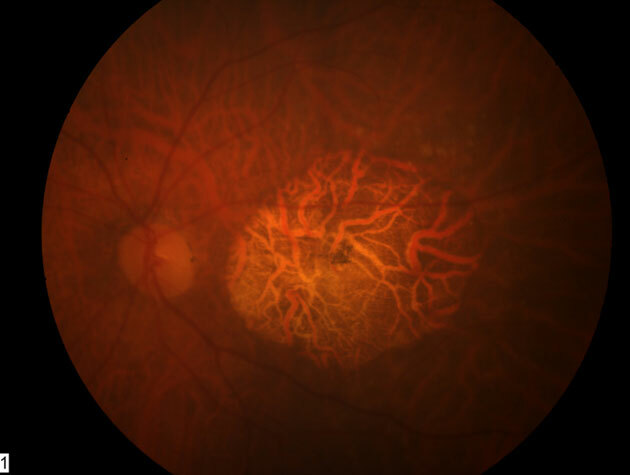 Macular degeneration is the leading cause of blindness in the U.S. In this disease, the light-sensing cells (photoreceptors) in the central area of vision degenerate and eventually die. The center of the eye, known as the ҭaculaӠarea of the retina, is affected, resulting in loss of central vision. Peripheral vision remains intact. 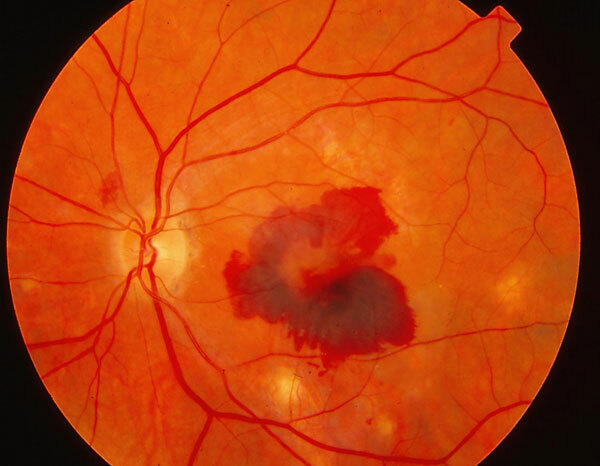 Risk factors for developing AMD include: aging, smoking, family history, specific genes associated with risk for the disease, high blood pressure (hypertension), high cholesterol, obesity, high fat intake, oxidative stress, race (macular degeneration is found more in Caucasians), and over-exposure to sunlight. Symptoms of AMD include: blurred vision, shadows or missing areas of vision (central scotomas), distorted vision (metamorphopsia), trouble discerning colors, and slow recovery of vision function after exposure to bright light. 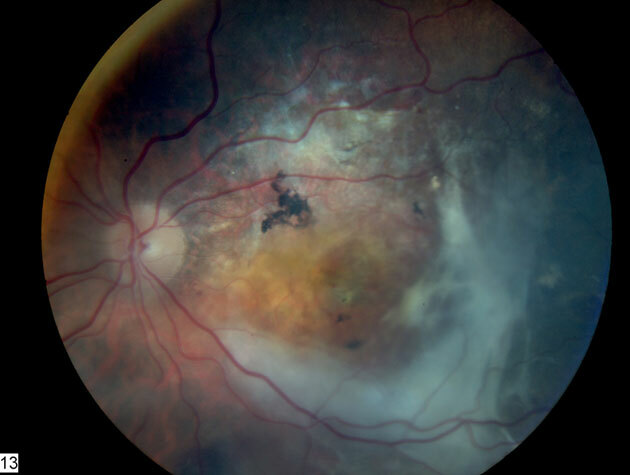 Most cases of AMD are the ҡtrophic,Ӡor Ҥry,Ӡform, resulting from atrophy of the retinal pigment epithelial layer below the retina. This causes vision loss through the loss of photoreceptors (rods and cones) in the central part of the eye. 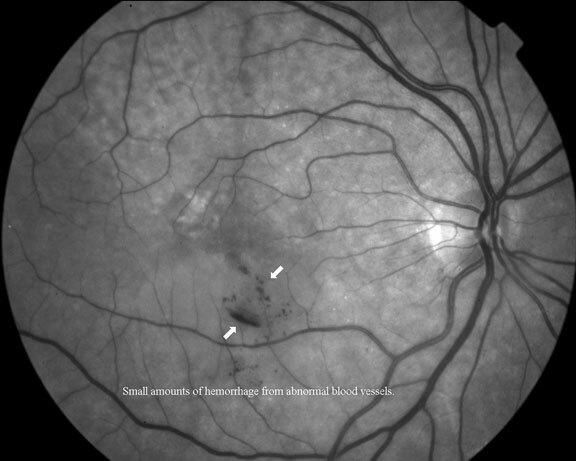 In the early stages of the disease, there are small, yellow deposits in the macula called Ҥrusen.ӠThe risk of sight loss is much higher when the drusen are large and numerous. Symptoms start with a blurred or blind spot, known as ҳcotoma,Ӡand progress to more severe distortion of sight. Eventually, central vision is lost, leading to an inability to read or recognize faces. 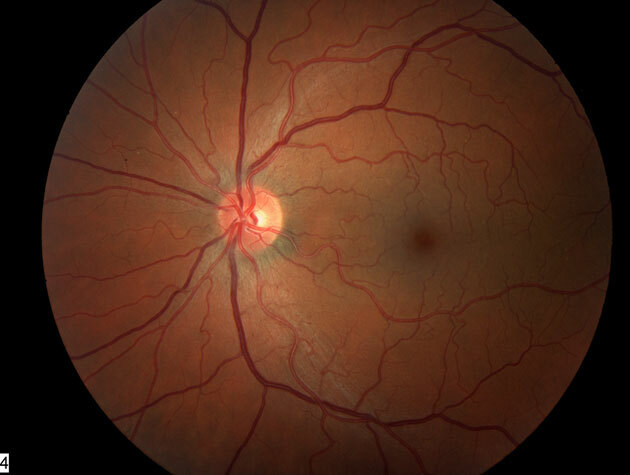 Research into genetic replacement therapy and stem cell transplants for the treatment of dry AMD and the juvenile forms of macular degeneration is ongoing. 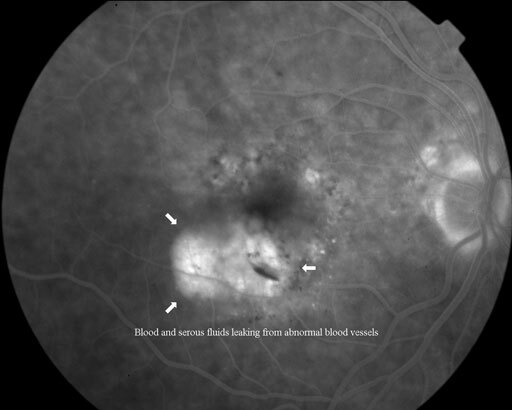 In the Үeovascular,Ӡor ҷet,Ӡform of AMD, immature blood vessels grow under the retina and leak into the spaces above and below the photoreceptor cells, ultimately destroying the retinal cells of the eye and causing permanent central vision loss. People with this form of AMD often develop the dry form before progressing over time to the wet form. 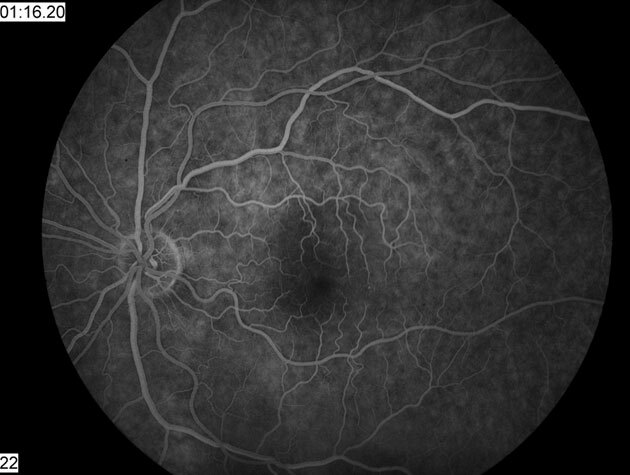 Once abnormal blood vessel growth under the retina has been detected, medications such as LucentisӠ and AvastinӠ can prevent further loss of vision in many cases. However, once the retinal cells have been destroyed and there is permanent scar formation, there is currently no therapy to bring these damaged cells back to life and restore vision. The Age-Related Eye Disease Study (ongoing) has found that a combination of high-dose beta-carotene, vitamin C, vitamin E, and zinc can reduce the risk of developing AMD by about 25 percent in people who have early but significant forms of the disease. People at risk for AMD might also be able to prevent progression of the disease by eating a diet rich in leafy green vegetables; avoiding bright sunlight by wearing a wide-brimmed hat and wrap-around sunglasses that protect against ultraviolet (UV) rays and blue light; avoiding smoking; and seeing a physician promptly if vision problems begin to develop. 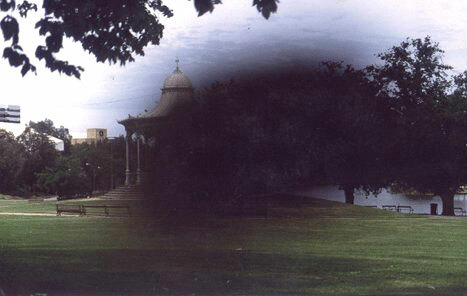 Macular degeneration, by itself, does not lead to complete vision loss, because peripheral vision is left untouched. Many people with this disease are able to live independent and productive lives. A wide variety of visual aids are available, such as magnifiers, bioptic glasses, closed-circuit television readers, and specialized screen-reading computer software such as JAWS for Windows. Education is important for people who experience vision loss, because it can help them become well-informed consumers of therapies and services. The major research focus of The Eye Defects Research Foundation is in the areas of molecular genetic and stem cell research. Our Foundation will concentrate on these two approaches to develop a cure for age-related macular degeneration, which as mentioned earlier, is the most common form of blindness in the United States, affecting 30% of all Americans over age 70, for which presently there is no cure. There have been dramatic advances in stem cell research in both the skin and the eye, which are of the same origin, making research in this area very exciting and providing great possibilities for a cure for these diseases by means of stem cell therapy. At an international eye symposium in Europe, one of the leading researchers into diseases of the eye, presented stunning research using mice that indicated cell-replacement therapy might be possible. Previous attempts to transplant stem cells, in the hope that they would become photoreceptors, have failed because the cells were not sufficiently developed. If the cells are isolated too early or too late, they will be unable to integrate. 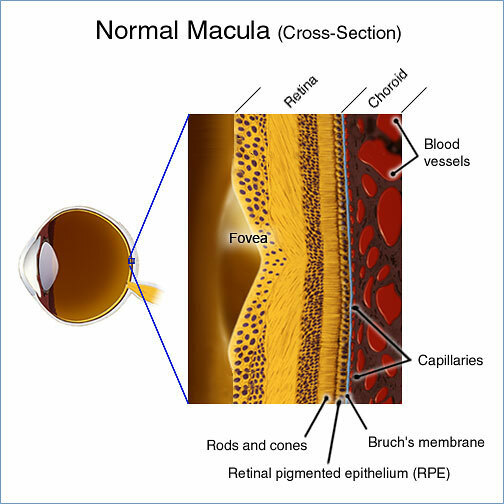 The first set of experiments tested whether retinal progenitor cells were better at migrating into the host retina than mature, differentiated neurons. Researchers were surprised when they found that the postnatal cells integrated more effectively into the outer nuclear layer of the retina. Subsequently, they determined that the best ages for the donor cells were from postnatal day three to postnatal day five. When researchers introduced cells into the retinas of mice that had been genetically-designed to have retinitis pigmentosa, the cells developed into mature rod photoreceptors, made synaptic connections with the existing retinal nerve cells, and partially restored sight. This research demonstrated that the transplanted cells had made the synaptic connection by showing that the pupils of the mice were responsive to light. 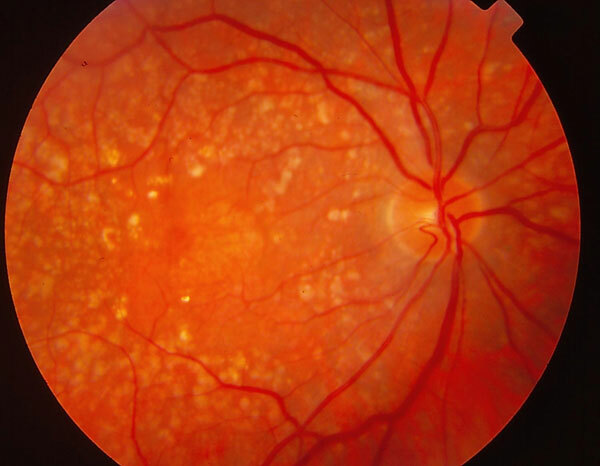 Scientists and researchers are working with new advances in technology to introduce new genes into human cells for the treatment of AMD. A defective gene can be removed or replaced, and a new gene introduced that will stimulate the cell to begin functioning properly again. The eye is an excellent candidate for gene therapy because it is immune-privileged and much of the disease-causing genetics are well understood. degeneration. In April 2008, stunning results were achieved using gene therapy to treat patients with Leber's congenital amaurosis (a juvenile form of retinal degeneration).This surgery delivers a healthy copy of the gene RPE65 into the retina using a harmless virus or ҶectorӠto carry the gene into the cells. In 4 out of 6 patients treated in a clinical trial, funded in part by the U.K. Department of Health and several private foundations, there was significant visual improvement, as demonstrated by the patient's ability to read up to four lines on a visual acuity chart and to navigate a maze, which was not possible prior to the surgery. 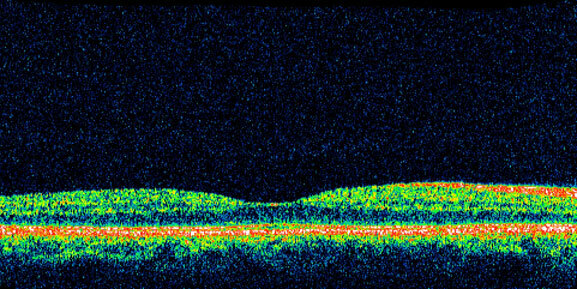 These dramatic results lay the foundation for similar potential treatments in more complex retinal diseases such as macular degeneration. These early studies clearly show the potential for ongoing research into the use of gene therapy in the treatment of eye disease. Our researchers, in collaboration with The Medical Genetics Group at Cedars-Sinai Medical Center have made seminal discoveries that could ultimately be used to cure this disease. Work is currently in progress to further clarify the extent of genetic defects and thus develop a cure for macular degeneration.